Peter Jablonski certainly has the sound and technique to do justice to the blockbuster demands of these concertos. In the "finale" of Concerto 3, he brings off the main theme's unidiomatic chordal writing with balanced, weighty tone; in the first-movement cadenza of No 1, the sequences of triplet chords are impeccably placed and balanced - a combination that eludes most pianists At the other end of the scale, Jablonski dispatches the light, scampering arpeggios and other rapid figurations with aplomb, though some of them miss the firmness and weight of his loud playing. Unfortunately, the soloist's temperament, at least here, is mismatched to the blockbuster technique. Jablonski seems not to connect with this music, for all his technical expertise and capacity for putting out sound. Only here and there - and mostly not in flashy moments - do these performances transcend the workaday. Thus, the B-flat minor concerto is marked by a capable but strangely dispassionate execution of the most challenging passages, and a fitful rubato in the lyric pages. The phrasing is musical, but doesn't mean much. There's a single flash of insight, at the start of the Andantino semplice's quick central section, where Jablonski marks off the top of the first arpeggio with a brief pause, providing a definition missing in the customary show-offy scramble. Similarly, the G major concerto, which doesn't avoid discursiveness here, only sporadically comes to life. At 2:13 in the first movement, when the clarinet introduces the second theme, Jablonski intones the piano's extended lyrical answer with a calm simplicity that's all the more appealing amidst the score's rhetoric. And the full-bodied articulation of the finale's quick passagework is impressive. The three-movement work that Decca presents here as the "Third Concerto" isn't, exactly. Tchaikovsky began a sixth symphony in 1892; he ultimately abandoned it in favor of the Pathétique, but reworked material from it into a one-movement concerto, the Op. 75. He began sketching a second and third movement for it, completed after his death in 1893 by Taneyev and published as the Op. 79 Andante and Finale. There is some logic to performing the three movements together, since they're all derived from the discarded symphony, but the composer obviously didn't authorize the practice. Jablonski's conductors are little help. Peter Maag seems unsympathetic to the B-flat minor concerto, to the point of allowing some slapdash playing in the coda, where the tuttis sound vaguely unkempt. In the first movement of the G major, Charles Dutoit here keeps a musical and steady, but none too firm, hand on the tiller; the tuttis don't sound grounded, and there's little attempt to elicit variety of color, though the conductor made his name in Montréal as a colorist. He's better attuned to the chamber-music quality of the uncut Andante non troppo - allowing the violin and cello melodies to blossom, fostering a pleasing interplay with the piano - and he propels the finale with springy dotted rhythms. Neither conductor nor pianist alleviates the high bombast quotient in the E-flat's "outer movements", and ensemble is poor in the first movement recap, with the strings lagging behind the piano's triplets at 12:08. But the central Andante, again, is appealing, with warm string sonorities and a singing quality; pulsing syncopations reinforce the forward motion in the faster central section. It's not by accident that I'm describing orchestral effects; the piano writing in this movement, largely comprising filler arpeggios, is more or less irrelevant. 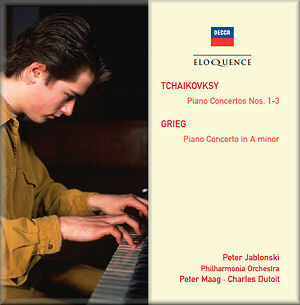 The Grieg is an unusual if substantial fill-up - I suspect it was the B-flat minor concerto's original disc-mate, and at first the performance seems cut from the same cloth, competent and routine. The first-movement development abruptly comes to life: the flute and horn solos, haunting and pensive, bring a sense of involvement that remains through the rest of the movement. The Adagio is attractive, if not particularly individual, but then the finale's spacious second theme again elicits expression and nuance; a bit later, when the movement's main theme returns, retro-fitted into 3/4 time, at 8:24, Jablonski gives it a nice dancey lift and a light touch, though the momentum falters before the tutti. The sound, a digitally homogenized rendering of Decca's old analog "house sound", is plausible but frustrating: a level that brings some presence to the woodwind solos and quiet strings leaves the upper brass sounding aggressive and raucous. Eloquence's proof-reading department needs attention. The front of the booklet identifies the composer as "Tchaikovksy," while both the rear insert and the booklet's track listing render his first name as "Pytor"; the track-listing credits Christopher Warren-Green and Andrew Shulman as soloists in the wrong slow movement: that of the E-flat Concerto, rather than the G major.